[From Wikipedia:] Outside the protective confines of the Hoover Dam Garrison, the player will encounter ruins of the old world, genetically altered creatures, strange technology, and six warring factions. Some factions seek to rebuild the old world, others wish to build a new one in their own image, and some simply desire chaos and anarchy. I did a bit of poking about on the internet after giving Fallen Earth a try, and found a lot of people basically saying that this is the type of game that’s going to weed out a lot of people early on, so that all that’s left are those who really want to play. And, guys, I was one of those people who got weeded out early on. I just hated the controls, which felt unnecessarily complicated. And as much as I initially tried to pass this off to myself as a by-product of the game being free-to-play (which is a huge bonus for any game, in my books), I’ve played enough other F2P games to know that this isn’t the case. Rather, there was a conscious decision made on the part of the game developers to make things harder than they had to be, and that wasn’t something that worked for me. For those who enjoy complex crafting systems (read: not me. There’s a reason I haven’t played Minecraft, and why Runescape didn’t last all that long on my computer), Fallen Earth has a lot to offer. It clearly wants you to craft your own items, rather than relying on looting to get you by. And a lot of thought has obviously been put into how to make the system work within the context of the game. Unfortunately, the graphics are only ‘okay,’ the combat system is clunky at best, and the storyline feels a bit too familiar to be all that interesting. 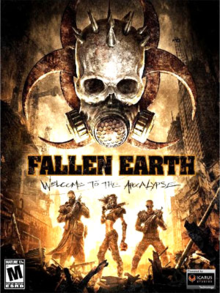 I feel like Fallen Earth is great for a very specific kind of gamer; but I, clearly, am not that kind of gamer.